Leinster’s 2016 pre-season friendly series is a pilgrimage of sorts, starting in Navan, moving on to Tallaght, then Donnybrook before our opening Pro12 fixture at the RDS. All they need to complete the symbolism is an Olympic-style torch to carry with them as they go! Anyway...on to the first instalment this weekend….what a great idea to stage a fixture like this at a club ground...and doesn’t hurt the Ulstermen to have less distance to travel either so it’s a good thing all round. Not surprisingly, Leo’s first matchday XV has a lot of youth on display...after so many success stories last season there’s every chance more can make the breakthrough this time around. Two names in particular stand out for me...in the backs there’s Adam Byrne. Of course you never want to go overboard in describing a prospect but judging by his outings for Leinster A over the years he looks like someone who can make the step up and with the kind of back three talent we have at Leinster that would be no mean feat, He could definitely do with a good showing on Saturday. Then there’s Dan Leavy. The few outings he had at the start of last season would have stood out pretty much anywhere else were it not for a certain Mr van der Flier tearing up trees ahead of him in the pecking order. Dan is coming up through in the back row which is also an area that is well stocked but still I think he can show he’s well able to provide an even bigger selection headache for Leo & co.
Our starting halfbacks are Nick McCarthy and Ross Byrne. As far as I can tell they have paired with each other for St Michael's, UCD, Leinster A & Ireland U20….sure why not tog out for the full squad to keep the streak going? That’ll just leave the full Irish side and the Lions ;-) If we’re looking for a 9/10 combo to (at the very least) provide some backup when internationals are away we could certainly do a lot worse than to have two who know each other's’ games so well. All in all it’s a very interesting side particularly in the back line and I’ll be keen to see how they approach the game particularly from an attacking standpoint. Then we have the usual pre-season friendly legion of substitutes, who I very much doubt will be wearing jerseys that go all the way up to 30! Of the bunch I reckon the most revealing introduction could be that of Fergus McFadden as I have wondered whether or not he’ll be moved into the centre where we have lost a considerable amount of talent. I was just getting set to publish when I learned that Ulster had posted their “matchday squad”....no starting XV as yet but it seems to be a group mostly inexperienced at senior level. A name that stands out is that of Jacob Stockdale who has impressed for Ireland at U20 level. 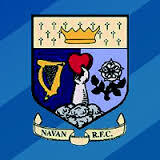 Hopefully you’ll be able to make it to Navan RFC for what promises to be a great day for the club in particular...but if you don’t, why not tune in to the site here as I’m hoping to do “live-blogs” of all our preseason matches over the coming weeks. Kyle McCall, Andy Warwick, Michael Lagan, John Andrew, Johnny Murphy, Zack McCall, Johnny Simpson, Rodney Ah You, Ross Kane, Connor Smyth, Alex Thompson, John Donnan, Alan O'Connor, Stephen Mulholland, Clive Ross, Conall Boomer, Nick Timoney, Matthew Rea. Dave Shanahan, Angus Lloyd, Aaron Cairns, Andrew Magrath, Johnny McPhillips, Brett Herron, Sam Windsor, Mark Best, Rory Butler, Jacob Stockdale, David Busby, Conor Kelly, Robert Lyttle, Louis Ludik.